In need of a new Estate? The Seat Leon X-Perience diesel estate could be a wise choice but how does it compare to Volkswagen & Skoda? The new SEAT Leon X-Perience Diesel Estate is the bigger, tougher, four-wheel-drive version of the popular Leon Hatchback. It’s not a fully-fledged SUV, but this will suit families who don’t want some of the hang-ups that come with said types of vehicles. Instead, what you get is a dependable and rugged family car that’s well-built, practical and which looks good. It’s got plenty of grip, comes with a raised ride height, and can tow those heavy loads that a conventional Hatchback just can’t. OSV takes a closer look at what it’s all about with our 2017 SEAT Leon X-perience Diesel Estate. The Leon Hatch is a super fun car to drive, and it’s pleasing that SEAT has managed to transfer its sharp handling to its bigger sibling here. The Leon X-Perience is obviously heavier, but the way it drives is barely any different to its racy stablemate. Body lean is a bit more noticeable in bends, but the four-wheel-drive system provides extra composure in poorer conditions. In a lot of ways, it makes sense that there are no petrol engines offered with the X-perience Estate. However, we think there should have at least been more choice where the diesels are concerned, of which there is just one. It’s a 2.0-litre unit that’s available with either 148 or 182bhp. The less powerful of the two can complete the 0-62 gallop in 8.7 seconds, while the 182bhp variant does it in an impressive 7.1 seconds. Despite the clear gap in the numbers on paper, any actual difference you’ll notice in real life is minimal. Both are strong overtakers, and both are highly competent. In fact, OSV would recommend the 148bhp variant on account of it being performative and cheaper to run. Don’t get your hopes up that the SEAT Leon X-perience Diesel Estate is a willing off-roader. Despite coming with grippy four-wheel-drive, it’s not really meant for off the beaten track. 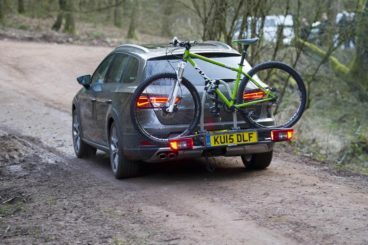 That said, it can help you out on steeper hills and rougher terrains a lot more than the sportier SEAT Leon Hatchback. It also makes for a fine tower. The smaller diesel can tow weight of around 2,000kg, but the bigger 182bhp manages only 1,600kg at the most. Inside, there isn’t a lot to fault. It’s pretty much the same cabin as the one found in the Leon, bar the occasional X-perience badge here and there. This means the standard of the plastics is high. 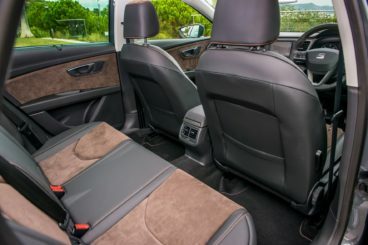 However, buyers hoping that a bit more luxury would have been added – like leather upholstery – will be disappointed. On the other hand, the dashboard is solidly put together from soft-touch plastics, while range-topping models get a classy 5.6” touchscreen which is simple to use and looks great. In terms of practicality and everyday use, it’s a comfortable car. The steering wheel and driver’s seat offer plenty of adjustability, and the driving position itself is excellent. You sit higher up than in the regular Leon but not as high as you do in an SUV, and buyers will appreciate that rear parking sensors are standard. Practicality is further enhanced by the wide opening doors that make access easy. Head and legroom will be just fine, even for taller adults, but a transmission tunnel will make things uncomfortable for middle-seated passengers on longer journeys. Storage space is good, and includes a cubby in the centre console, some pretty cavernous door bins, and a big air-conditioned glovebox. The boot, meanwhile, measures a respectable 587-litres. That’s decent in isolation, but most of its rivals boast more luggage capacity. You can fold the rear seats to increase that to 1,470-litres and the boot comes with a handy two-level floor that makes it easier to slide in bulkier items. Standard kit is good, with entry models getting 17” twin-spoke alloys, tinted rear windows, black roof rails, as well as twin-exhaust pipes. Sporty indeed. The SE model gets air conditioning, all-round electric windows, Bluetooth, and cruise control. The SE Tech pack will cost almost £2,000 if you go for the 148bhp variant, but it’s well worth adding. It adds automatic headlights and wipers, sat-nav, a DAB radio and a 5.8” touchscreen to your car. There is also the option of the £1,250 Lux pack that features heated front seats and leather upholstery. Is it safe? You bet. The Leon X-perience was awarded all five stars when crash-tested by Euro NCAP, while its standard safety kit includes traction control, electronic stability control and lots of airbags. Prices for the new car start out from £28,200 and rise to £32,200. If you prefer to lease, you can pick up a deal from £320 + VAT per month. For more information on our leasing deals, check out our page here. In terms of its running costs, the SEAT doesn’t fare too badly. However, there isn’t much to choose between either diesel. The 182bhp variant is the more powerful of the two, and it can return 57.6mpg. The 184bp variant returns 59.8mpg. Not much difference at all, and each model costs £130 per year in road tax. How much you pay for insurance depends less on the engine you choose and more on the trim. For example, the 148bhp sits in insurance group 20 to start with, but going for the range-topping trim knocks it up to insurance group 26, which is where the 184bhp engine sits. Considering the power and might on offer here, returns of over 56mpg from a four-wheel-drive 2.0-litre 184bhp engine are impressive. The four-wheel-drive system turns the standard Leon into a car possessed. SEAT have got the rugged aesthetics beautifully nailed here. With no petrol engines on offer, you have no choice but to deal with diesel clatter. Okay, it’s nice. But it doesn’t feel as special as rivals. Let’s see how the car fares against its rivals in the comparison section of our 2017 SEAT Leon X-perience Diesel Estate review. The new Volkswagen Golf All Track Diesel Estate is like the Golf Estate but adds “go anywhere” ability to an already impressive box of tricks. 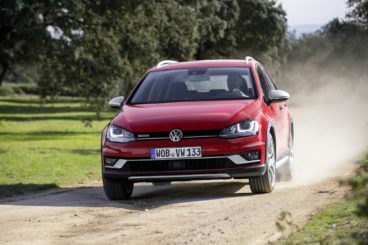 As an off-road Estate, you’d expect the VW Golf AllTrack to struggle with bends at speed. Thanks to some fine engineering, that’s actually not the case here. The AllTrack feels just as composed as the standard Golf Estate, despite coming with higher suspension. It feels smooth on broken surfaces, too. In terms of its engines, a 1.6-litre TDI diesel kicks things off. It develops up to 108bhp, comes with a responsive 6-speed manual transmission, and can do 0-62 in 12.2 seconds. It feels a bit overwhelmed when the car is fully loaded, which is why we recommend the 2.0-litre TDI diesel instead. It’s available in two power guises, but the smaller 148bhp should be enough for most buyers. It does 0-62 in less than 9.0 seconds, while the more powerful 181bhp variant does it in just 7.8 seconds. However, while most buyers won’t need to reach such speeds, there isn’t much difference between the two when it comes to economy. The 148bhp unit can return 59mpg at best, while the 181bhp model averages 57.6mpg. Both cost £110 a year in tax, too. The entry level 1.6-litre diesel engine also costs £110 a year in tax, but is the only power plant that can return over 60mpg economy – but only just. However, it’s cheaper to buy. All models, meanwhile, are four-wheel-drive. Inside, the Volkswagen Golf AllTrack Diesel Estate benefits by sharing its cabin with the standard VW Golf – for the most part, at least. It does get raised suspension which helps it to cope with rougher terrains, while the dashboard gets lashings of chrome in what is a nice touch. Other than that, the quality of the materials is good, while standard kit includes cloth upholstery, Bluetooth, and a leather steering wheel. Is it practical? Undoubtedly. Four wheel drive adds extra grip, while inside there is a promising amount of space for you and your passengers. There is a generous amount of storage space, including massive door bins, storage compartments in the roof and centre console, and a drawer beneath the passenger seat. The boot measures 605-litres, which makes it just about bigger than the SEAT, and it can be extended to 1,620 by folding down the rear seats. The new Skoda Kodiaq Diesel Estate is an impressive-looking large car that’s assured on the road, practical and pleasant to be in. On the road, it feels safe, solid and competent. And while it might be big, it’s also fun to drive at times. Steering is precise, body lean is well managed, and it’s an easy car to plant. Driving Mode Select is an optional extra worth adding. It lets you flick between three driving modes, with Sport tweaking its characteristics so that it feels almost as entertaining as a video game (but not quite, of course!). Four wheel drive is optional too, but we don’t think it’s all that necessary. 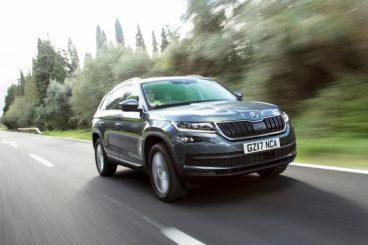 Without it, the Skoda Kodiaq has a lot of ability, and moreover it’s highly unlikely that buyers will be taking it to the ends of the earth. In terms of the engines, a 2.0-litre 148bhp diesel unit should satisfy most buyers. It gallops from rest to 62mph in less than 10.0 seconds, and copes well with steep ascents. A 187bhp version of the same engine is over 1.0 second faster and offers a bit more performance. The 148bhp is cheaper to run, and averages returns of the 56.5mpg economy while emitting 131g/km of CO2. The more powerful diesel is slightly more expensive to run, but you should be able to see returns nudging 54mpg on a good day. However, adding four-wheel-drive to either model will see those numbers plummet into the forties. Both units come with selective catalytic reduction, which has helped to keep emissions down, and they each cost £140 per year in road tax. How’s the cabin? We have no complaints. It might not be as eye-catching as some modern-day SUVs, but the Skoda Kodiaq Diesel Estate can claim an aesthetically pleasing environment that’s well-built and composed of generally high-quality materials. Insulation is excellent, and very little noise gets into the cabin. Ride quality is impressive, too, while the dashboard is marked with bold vertical air vents and relics from the Kodiaq’s past. However, to recognise these geometrical traces of the past, you’d need a pretty good memory. Still, it’s nice to see a model retaining its heritage while looking towards the future, and Skoda does both with the addition of a glass-fronted 8” touchscreen that’s compatible with Apple CarPlay. In terms of practicality, we have to give the car a 5/5. Five adults will be just fine even on longer trips, plastic tips that deploy automatically on the edge of the doors as you open them prove the perfect way to avoid scratching someone else’s car tight parking spots, while a useful luggage net either side of the car’s transmission tunnel is a nice touch. The boot, meanwhile, measures 720-litres with all seats up and just over 2,000 with the rear seats folded. That blows the SEAT out of the water. Need a Leon for all seasons? SEAT are in the form of their life at the moment, rolling out top model after top model. The new Leon X-perience has everything buyers are on the lookout for – a family car that’s stronger and bigger than a Hatchback but which comes without any fully-fledged SUV flaws wants. It’s rugged, comes with grippy four-wheel-drive, and feels upmarket. It’s bold, powerful and exciting. Care to join the brand as they hit their best form with the new SEAT Leon X-PERIENCE Diesel Estate?